SEBLOD comes pre-loaded with some position variations which can be a useful way to add styling directly to your template positions. 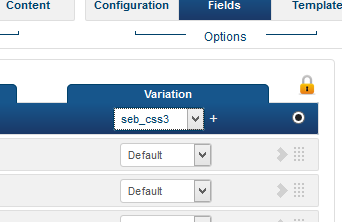 As a demonstration, select the seb_CSS3 variation and then click the "+". 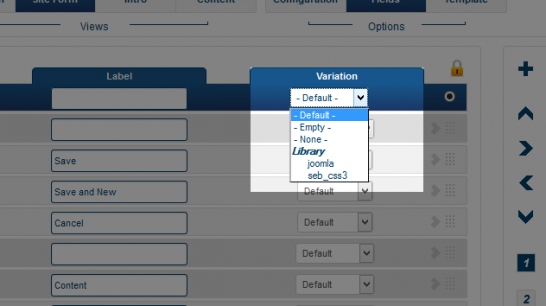 In the popup window, you have the option to add many of your own styling parameters directly to your template position. This is a quick way to add some simple styling, without needing to write any code! Alternatively, you can create your own position variation which will appear in this list. Creating a position variation can be useful, as it gives you a re-usable layout that you can use on different Content Types and List & Search Types. Position variations for your selected template are available at the top of the each position in your template (see right). It's that simple. $content is a variable available within all variation files, and what it does is return all rendered fields in the position on which you applied this variation to. In our case we simply wrapped all that content in a div, added our AdSense code, but you can replace that code with whatever you want. Where field_name is the name of the field you wish to render. You can of course render any field(s) you have assigned to the position you're applying this variation to.